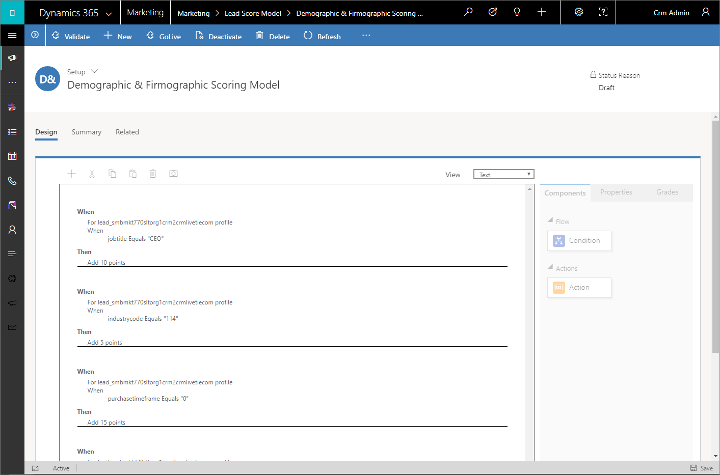 Dynamics 365 for Marketing can calculate a score for each lead based on demographic details, firmographic details, and actions taken by the associated contact (or for account-based leads, contacts belonging to the associated account). Scorable interactions include, for example: opening an email, submitting a landing page, visiting your website, or attending an event. Each scoring model includes a sales-ready threshold. When a lead's score passes this threshold, it gets marked as sales ready, which can trigger other events within Dynamics 365 for Customer Engagement, including advancing the lead through its business process and alerting tele prospectors or salespeople to pick it up. Automatic lead scoring only works for leads that are associated with a contact or account. Scoring fails for leads that don't have a contact or account associated with them. 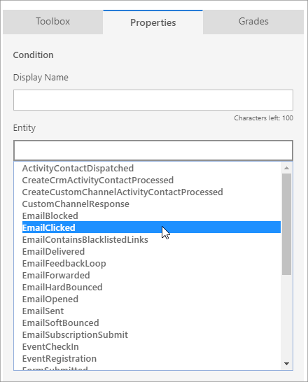 Also, segments in Dynamics 365 for Marketing can only include contacts, not leads or accounts, which means that you can only address marketing emails to contacts. Your landing pages will typically either create a lead/contact pair when they create a new contact, or associate new leads with existing contacts when they're available. But when you create a lead manually, you must also associate it with a contact manually to enable lead scoring. Lead-scoring models provide rules for how a lead's score will automatically increase or decrease based on specific activities and interactions, demographic information, and over time. The model also establishes a schedule of grades that characterize ranges of scores in plain language (such as hot, warm, and cold), and sets a specific score threshold as "sales ready", which means that the lead can now be forwarded to a salesperson. A typical lead-scoring model would increase a lead's score slightly in response to a single email open or website visit, moderately in response to an email click or landing-page submission, and significantly in response to an event registration or attendance. The model could also stop counting interactions that happened some time ago, effectively reducing a lead's score as it ages. It might also increase or decrease a lead score based on information about the associated contact or company, such as location, purchase history, company size, industry, job title, and more. You can create as many scoring models as you want. If you have more than one model, all leads will be scored according to each model and you'll be able to see the score and grade for each of them. 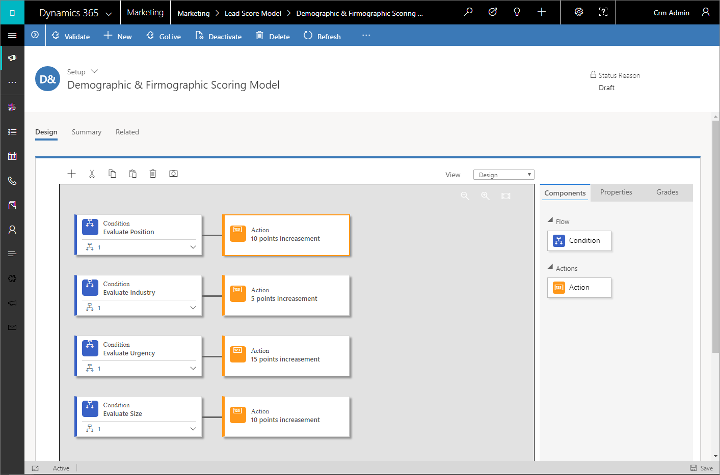 To view, edit, and create lead-scoring models, go to Marketing > Lead Management > Lead Scoring Models. This opens a standard list view, where you can create, delete, search, sort, or filter items in the list. Select any item in the list to open it, or select New to create a new one. You'll spend most of your time working on the Design tab, which opens when you first open or create the model. This is where you define the model's logic by dragging tiles from the Toolbox tab to the canvas to construct one or more condition/action tile pairs. Each pair starts with a Condition tile, which establishes a rule (such as email clicked) and ends with an Action, which defines how the score should be adjusted when the condition is met. Your model can include any number of condition/action pairs. The scoring-model canvas is similar to the customer-journey canvas. Add tiles by dragging from the Toolbox tab. Select a tile and open the Properties tab to make settings for that tile. Use the toolbar above the canvas to cut, copy, paste, and delete a selected tile; you can also add a tile and take a snapshot from here. Set the Entity target to Account or Contact. This setting establishes which type of leads the model will score. Contact-based leads are associated with a contact record, and are scored based on information and interactions related to that contact only. Account-based leads are associated with an account record. They are scored based on information from the account, plus information and interactions related to each contact that belongs to that account. Leads associated with both a contact and an account are treated as contact-based leads. The condition tile is a compound tile, which includes both parent and child tiles. When you add a condition, both the parent and one child are created. Use the expand/collapse button at the lower-right corner of the tile to show or hide the child tiles. The parent condition tile just gives the condition group a name. Select the parent and open the Properties tab to assign the name. You can assign as many child conditions as you need by dragging additional condition tiles onto the parent. All conditions belonging to the same parent are combined using an AND operator, which means that all sibling conditions must evaluate to TRUE for the attached action to be triggered. The logic for the condition is contained in the child tile(s). Choose a child condition tile and open the Properties tab to establish the logic. Display Name: Shows the name for the tile, as shown on the canvas. 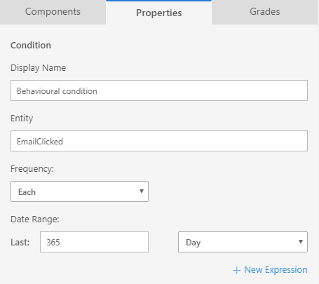 Entity: Choose a Dynamics 365 entity to monitor or check for the condition. For example, choose EmailClicked to look for records where a contact has clicked a link in an email. Frequency: Choose how often the condition should be triggered. Choose Each to score on each occurrence (such as to increase the score on each email click). Choose At least to score just once (such as to increase the score on the first email click, but ignore subsequent ones). Date Range: Enter a date before which scorable events won't be counted. For example, set this to a year to ignore all email interactions that occurred more than a year ago. This can result in scores going down over time as interactions age. New Expression: Select this button to add a new expression to the condition. The additional expression further tests the condition based on stored data. For example, you could add an expression for "City = New York", which would modify the condition so that only email clicks made by contacts in New York City would trigger the condition. You can add as many extra expressions as you like to create complex conditions. All expressions belonging to the same condition are combined using an AND operator, which means that all expressions must evaluate to TRUE for the overall condition to be true. Fixed rules are based on fixed demographic or firmographic data found in lead or contact records. Behavior rules are based on interactions like email clicked, event registered, or website visited. The action tile that comes after a condition tile controls how a lead's score will be modified when the condition is met. To set the action, select (or add) an action tile after a condition tile, then open the Properties tab, where you can set the score to either increase or decrease by any integer value. The canvas provides an easy, graphical way to assemble your scoring rules, but it leaves most settings hidden until you open a tile's Properties. To get a quick overview of all your logic, set the View drop-down list (above the canvas) to Text. This shows you a compact, text-based view of your rules, expressed in a way that's similar to an actual database query. The main reason for scoring leads is to provide a way to identify your best leads and to decide when a lead should be forwarded to a salesperson for more attention. Therefore, you'll nearly always set a sales-ready threshold for each lead-scoring model. You can also set up a schedule of grades as a way to offer an interpretation of the score (such as cold, warm, or hot) as it progresses toward sales-ready. When a score reaches the sales-ready threshold, a plug-in automatically sets the sales-ready flag on the lead to *True. If a lead is scored by multiple models, the flag is set as soon as any model reaches the threshold. This triggers a workflow that automatically moves the lead to the sales-acceptance stage of the lead lifecycle. You can customize this workflow as needed. The grades and sales-ready score apply to the entire model, regardless of how many conditions it contains. To set them, open the Grades tab next to the canvas. Enter an integer in the Sales Ready Score field to set the sales-ready score. To add an additional grade, select New, which adds a new section to the tab, where you can enter a grade name and the score range where it applies. 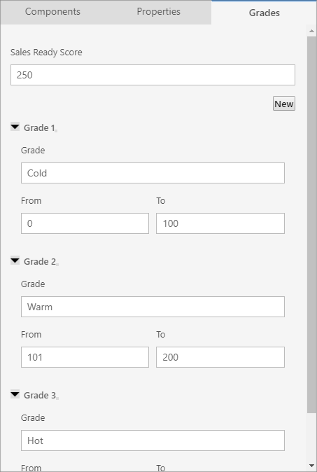 Grade ranges must be continuous and non-overlapping. Open the Properties for a Condition tile. Then set the Entity to EmailClicked. In the Entity field, type a period after the EmailClicked entity you just added to open a new drop-down list that shows the various types of hops you can make from here. 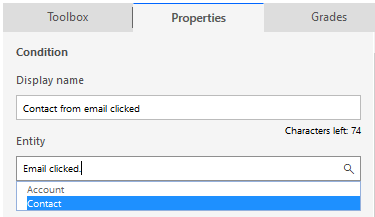 Choose EmailClicked_contact to hop to the contact profile. 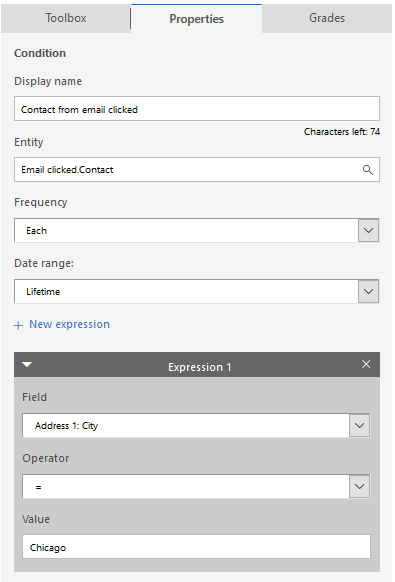 Now you can add Expressions to specify values that come from the contact record associated with each email click. For example, you might only want to score on clicks for contacts that live in Chicago. You can establish up to five hops by using this technique. Lead.lead_contact_parentcontactid: Lets you score leads associated with contacts who have particular properties (such as contacts who have a Microsoft email address—where Email | contains | @microsoft.com). Lead.lead_contact_parentcontactid.contact_account_parentcustomerid: Lets you score leads associated with contacts who belong to accounts with particular properties (such as accounts where Number of employees | > | 500).